India launched the first of seven navigation satellites intended to deliver a regional positioning system on Tuesday. 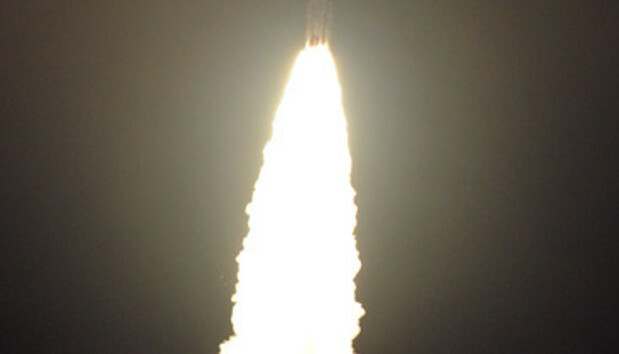 The system will be similar to the Global Positioning System owned by the U.S.
IRNSS-1A, the first of the seven satellites in the Indian Regional Navigation Satellite System (IRNSS) was launched into space aboard PSLV-C22, a Polar Satellite Launch Vehicle of the Indian Space Research Organization. IRNSS is designed to provide position information in the Indian region and 1500 kilometers around the Indian mainland, ISRO said. It will offer standard positioning services to all users, and encrypted restricted services to authorized users. Ground stations for the generation and transmission of navigation parameters, satellite control and satellite ranging and monitoring have been set up in 15 locations across the country. The IRNSS system is expected to be completed by around 2016. India plans to use the system for a variety of applications, including disaster management, vehicle tracking and fleet management, mobile phone applications, precise timing, visual and voice navigation for drivers and terrestrial, aerial and marine navigation. Of the seven satellites to be deployed for the IRNSS project, three will be in geostationary orbit, while the rest will be in inclined geosynchronous orbit. Satellites in geostationary orbit follow the direction of the rotation of the earth so as to be in the same position relative to the earth at all times. Europe is also setting up a global navigation satellite system called Galileo, which will be interoperable with the U.S. GPS and Russian GLONASS global satellite navigation systems. The IRNSS is expected to provide a position accuracy of better than 20 meters in the primary service area. The mission life of the satellites is 10 years, ISRO said.